Patty & Emily at Broadway Up Close! In case you didn’t know, we love to talk and learn about theatre. 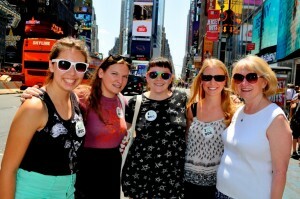 So, when we found out about Broadway Up Close walking tours, we were like, “Sign us up!” and they did! One of the great things about these tours is that they are given by theatre professionals and lovers. Our fantastic guide was Theresa, a stage manager. (She just happened to work on Under My Skin, which we obviously told her we loved!) Our tourmates were Emily’s cousin and a mother/daughter pair from the Midwest. The group had varying degrees of theatre knowledge, but we all couldn’t wait to learn more! Broadway Up Close offers three tours, starting with the Act 1, which is what we took. There are no set tour times, so you can request a time that works best for you! Act 1 starts at the Nederlander and covers the history of 42nd street, and the Broadway houses on the east side up to 45th street. There was such a wide range of information, history, and stories that everyone can get something out of it. We don’t want to give it all away, but we’ll share this one tidbit: Jujamcyn got its name from the first names of the children of the original owners, Judith, James, and Cynthia. It all makes sense now! The tour was about two hours, and even though you’re walking, it’s pretty stop and start, so there’s lots of resting. We had a great time, learned a lot, and got to spend a morning talking Broadway! These tours are great if you’re visiting New York, but also if you live here! They’re great for theatre lovers, and also anyone interested in the rich history of New York City. For more information on booking your tour, visit www.broadwayupclose.com. Here’s a photo of us and our tour group! Love Never Dies: Patty & Emily at The Phantom of the Opera Again! When the Angel of Music calls you, you follow. Seriously. If you don’t, he’ll hypnotize you and murder people around you. So, we certainly weren’t about to say no to seeing Norm Lewis and Sierra Boggess again in Phantom. What if something happened to Beth Leavel?! But luckily, nothing went wrong, and the show moved along like a well-oiled, slow-moving chandelier. Norm and Sierra were in great voice, and still playing up the camp factor to great effect. The audience was super into it, as usual. A woman near by whispered, “Wow!” after Norm’s Music of the Night and was moved to tears by the end. Not like our tears of laughter, but the important thing is that everyone had a good time. Before the show, as an added bonus to the Phantom experience, there was a reception at NYY Steak, a Yankees themed restaurant. We were excited to see that they even offer Broadway themed cocktails, like the Bronx Bomber! Then someone reminded us that’s a nickname for the Yankees, not just a play from last season starring Chris Jackson. The next time you have sports loving relatives in town, take them to NYY Steak. It’ll ease the transition into the glitz of Broadway. Plus, they had delicious sliders and cheese empanadas. See Norm Lewis and Sierra Boggess in The Phantom of the Opera! Get tickets here! And before the show, get dinner at NYY Steak. Don’t forget to sing the score to Damn Yankees!